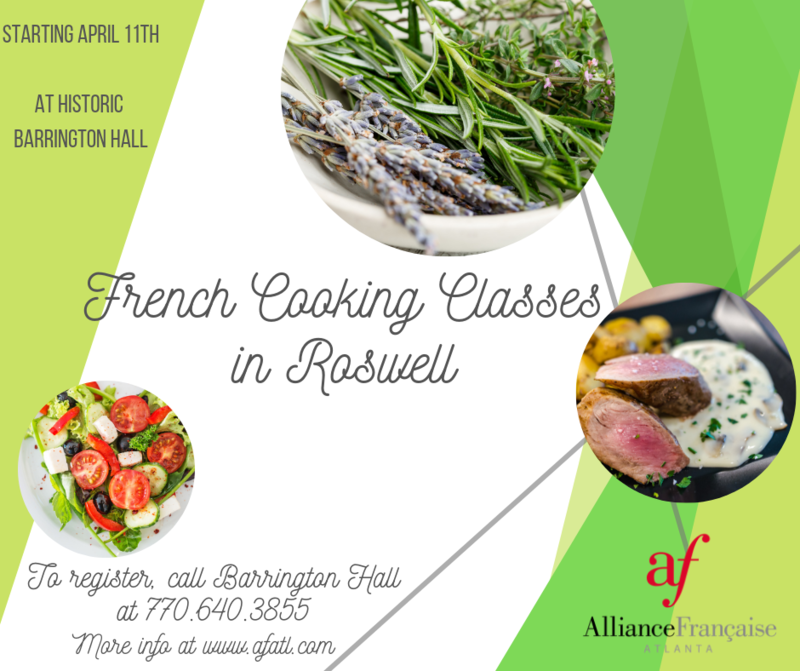 Introducing our new French Cooking Classes in Roswell! Learn French cooking techniques from a French chef with Alliance Française of Atlanta… and learn some French while doing so! Bénédicte Juston will be your chef. She teaches French at Alliance Française in Roswell and has been cooking professionally out of her home and teaching cooking classes for years. She is originally from Lyon – the gastronomical center of France. Classes will be taught in English with plenty of French cuisine vocabulary sprinkled in. All levels of French are welcome, beginners too! Classes will include hands-on teaching and preparation in Barrington Hall’s gourmet kitchen and then dinner with a glass of French wine paired with each menu. Price: $65 per person, per class. Only 8 slots per class, register fast! Thursday, April 11 at 7pm– Le Nord de la France (Normandy and Northern France) – SOLD OUT! Thursday, May 2 at 7pm – Le Sud de la France (Provence and the South of France) – SOLD OUT!